The Taize website says, "Singing is one of the most essential elements of worship. short songs, repeated again and again, give it a meditative character. Using just a few words they express a basic reality of faith, quickly grasped by the mind. As the words are song over many times, this reality gradually penetrates the whole being. Meditative singing thus becomes a way of listening to God. It allows everyone to take part in a time of prayer together, and to remain together in attentive waiting on God, without having to fix the length of time too exactly. To open the gates of trust in God nothing can replace the beauty of human voices united in song. This beauty can give us a glimpse of 'heaven's joy on earth' as eastern Christians put it. And an inner life begins to blossom within us." We hold a monthly Taizé service on the first Sunday of most months at 6.30pm (with variations according in theme to the Church's calendar) to encourage people to encounter God in a new way. The informal candlelit service is quiet and reflective, and includes bible readings, prayers and times of silence as well as music. The meditative chants are simple and easy to learn, and you quickly be able to join in. 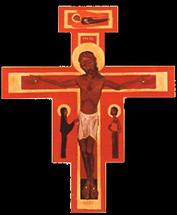 Taizé is the home of an international Christian community in southern France. The community is made up of over a hundred brothers, and regular times of prayers, chants and silence are at the heart of their daily life. By joining in our monthly Taizé service, not only are you able to experience God in a different way - you are also linking up with a community which spans the whole globe. For more information about Taizé, visit the Taizé website at http://www.taize.fr or go to the Taizé in London page on Facebook.